Money is power, and without it, life is meaningless. In a country whose economy is in shambles, second-year Economics university student Kimimaro Yoga understands this fact all too well, as he is surrounded by the relatively luxurious lives of his peers and struggling to make ends meet. However, his world is turned on its head when a stranger in a top hat arrives one late night at his door. Going by the name Masakaki, the visitor petitions Yoga to come to the Eastern Financial District, a place where money flows in abundance if one offers their "future" as collateral. Although reluctant, greed triumphs reason and Yoga accepts the offer; thus, taking on the mantle of an "Entre." But unbeknownst to him, the land of wealth he has entered is an alternate realm built in the likeness of his own, where Entres are forced to participate in weekly duels called "Deals," with their collateral at stake. Pitted against his countrymen and fate, Yoga must quickly adapt in this new world if he hopes to protect his fortune and future—and discover just how much money is truly worth. I was surprised to see that most of the reviews for this anime rated it so low! I honestly thought it was a good anime! The story is very original, the first with a setting and plot like this that I've ever seen. It does get confusing at points, especially near the end, but it really kept me entertained. I think it just needed a few more episodes to develop it more. I really loved the art, it's just the kind I like ^^ I enjoyed how they made the creepy Midas guy (forgot his name ^^") kind of 3D, though it was a bit weird in the beginning and took some getting used to. I like how the main character honestly has no idea what the heck he was doing in the beginning, and how he and his asset interacted. I think there should have been more episodes (once again) so that there would have been better character development, and I would've liked to have seen Masyu and Kimimaro interact with each other more and to have seen more of their battles. First I have to say that this is only my second review, and I only write reviews for anime that I think are underrated. This review may be some what one sided, but I honestly feel this anime deserves a lot more respect than what it is given, so I'm here to balance things out a bit. Overall I give this anime a rating of 10, which may seem too high and simply not true, but I guess it all comes down to perspective right? Not everyone believes in the same thing, not everyone sees things the same way. Some people live for the future and others live in the moment. That seems to be the basic underling philosophical concept explored in this anime, and the fate of Japan depends on how the main characters handle this question. They certainly could have done a better job at exploring the concept, but for an 11 episode anime you can't really fault them for giving it a good try. Some people will dislike the philosophical nature of this show, they might even consider it to be contrived and convoluted, and an unnecessary addition to an otherwise great anime. It is of course moderately convoluted and hard to understand at points, with small holes in the plot and a lack of some character development. However, this anime is attempting to explore complex philosophical questions that don't necessarily have one right answer. The core of the story is not economics, in fact it would be pointless to criticize the economic theories presented in this anime, because it is after all a fictional show and the validity of the economic reasoning presented herein is far beyond the point of what this anime is really about. To claim the philosophical struggle between wanting a good present and wanting a good future destroys this anime, is to claim the fundamental foundation of this anime should simply be ignored. From the very beginning it is clear the underlying basis for this story is a struggle between two different paradigms and ideologies about what really matters in this reality. The economic overlay is simply a fitting way to present those philosophical conflicts and create the framework for a story containing characters who are given the chance to accumulate vast wealth and thus wield great power of the state of reality and the future of our reality. Even if it comes off as nonsensical babble to half the people who watch it, there is always something you can get from an anime like this, even if half of it doesn't make much sense to you. The story isn't as disconnected and structureless as it may first appear, although it certainly isn't perfect either. The spectacular art and gripping action make up for any downfalls this anime may have, and you will certainly not struggle to keep watching this anime. The main idea behind this story line involves a hidden world of money and fierce battles (so called "deals"). The Financial Districts are other worldly realities where only a select few are granted access. These hidden realities exist in all major economic epicenters of powerful nations, and the people plunged into this world are given an "asset" (some sort of creature) with which they must fight for the security of their future. Each "Entre", as they are called, have different goals and motives for fighting these battles. The story line of this anime is extremely unique, nothing else like it exists. That alone makes it worth watching, because the majority of anime made these days seem to lack any true individuality and just take from plots that we've seen over and over again. While it does have a few small holes, I feel they did an excellent job at fitting so much into 11 episodes. There was hardly any filler at all and even though there was a lack of character development they used their time wisely. I felt that they had a goal in mind from the start and reached that goal in a more conclusive and satisfying manner than most animes are able to achieve. If you think they strayed off onto wild tangents and didn't seem to know where they wanted to take it, then I would say you need to watch it again and watch it much more closely this time. Although a bit predictable, they did build up the story in a meaningful way to reach their desired outcome. The art is this anime is without fault. The style of the art has some very unique features, such as a sort of digital blocky overlay effect present in certain parts of the anime to facilitate scene transitions and the presence of an asset. It also uses a mind-boggling blend of 3D and 2D visuals that doesn't particularly disturb the overall feel of the artwork, but provides outstandingly detailed and colorful scenery that captures the imagination and jumps out of the screen, particularly in the financial district. The characters are also moderately unique, especially the designs of the two lead assets, Msyu and Q. The character designs of these human-like assets will certainly provide all the cuteness and uniqueness one desires in appearance of certain female character roles. The quality of the art is very high quality and extremely detailed, and is probably one of the strongest features of this anime. It is very fluid and the emotional expressions of most characters are very clear and easy to read. While I didn't really pay much attention to the sound, it was definitely very good quality and suited the anime very well. The action scenes had gripping and intense dramatic music and the emotional scenes had deep and heavy scores that echo the gravity of each situation nicely. The character voices were actually very good, and in particular I thought the voice of Masakaki was extremely well done, and helped a lot to enforce the ominous insanity of his character. As I said, they did skip out a bit on character development, but it still deserves an 8 because the relationship development between the main character Kimimaro and his asset Msyu was actually very well done. I don't really get sucked into the relationship aspects of most anime, but I couldn't help admire the way their relationship grew stronger in this show, especially considering the way it started out. Msyu had an undeniably adorable personality, however I felt like there was a lack of explanation and back story for her and all other assets. Her desires and understanding of the world wasn't very well explained, although I can understand why they avoided that for the most part. They did dive into it a little bit, but it seems like they decided to skip over it and just leave it as a bit of a mystery for viewers to discern on their own. Kimimaro is a rather typical male lead character, the classic ordinary everyday guy constantly conflicted by morals and an inability to do things the right way until he is literally put through hell and finally realizes what needs to be done. While he may be overly stereotypical in a lot of ways, he does have a certain respectable uniqueness about him which seemed to be a necessary and key part in the development of his relationship with Msyu. While Kimimaro does have a moderately developed back story revolving around the fate of his father, there is another Entre named Souichirou who attempts to befriend Kimimaro and mentor him on how to reduce any damage done to the real world by planning the outcomes of his battles carefully. Souichirou probably has the most detailed back story, he also has issues concerning his father, and claims to fight for the present reality. There is no denying that the anime has an overall enjoyment factor of the highest degree when all aspects are considered - well it did for me anyway. It had all the necessary features to make a great anime in my opinion, the story was unique and fairly well done, and involved ideas that I really enjoy. The mix of a magical money world hidden away from reality and the philosophical concepts built around that world make for a story that had me on the edge of my seat all the way through. The phenomenal art and the impressive battles only served to push my enjoyment level to the limit, and I finished this anime in less than three days because I just couldn't stop watching it. It could have been a bit longer but I have no real problems with the way they handled the story given the length of the anime. This is certainly an anime that is worthy of reaching my top 10 list of anime. I don't re-watch many anime series but this is one I would consider watching again. It’s clear from my reinterpretation of the title that I flat out didn’t like it. I sat through the season hoping it would get better as it went along. It didn’t. So to sum up what this show did wrong: Almost everything… except the central concept and opening/ending scores. Honestly, this anime didn’t give me anything to justify my watching it. Other than its interesting premise of another world called the Financial District which controls and inevitably destroys the economy of each respective country in the physical world, there’s nothing else to see here. Our protagonist, Yoga, Kimimaro, is a kid with no drive to do anything productive with his life. Right off the bat, we’re presented with the generic “guy with no redeeming qualities” to play with. Mr. Boring here hates his dad, has no girlfriend because he was too much of a wuss to ask out his childhood friend, is an econ major, and works part time at a convenience store to pay for living expenses. His existence is double its original worth once he’s paid a strange visit by a guy named Masakaki. Masakaki is actually kind of an interesting dude because he represents the law of the Financial District and is a guide to those introduced into this new world. There’s not one of him as each District has their own Masakaki of sorts. Throughout the anime, he pops up several times to inform people of major events going on and announce duels between those involved in the District. There’s a plethora of supporting characters but I’m getting too long-winded as it is with just the main ones to detail the rest so I’ll tell you now that the show isn’t worth watching for them. Msyu is Kimimaro’s Asset and eventual love interest. Blehh. Jennifer is an exec of IMF, an organization attempting to bring down the Financial District. She, for some reason, is always eating burgers when she’s out investigating. Hanabi is the childhood friend mentioned earlier. Takedazaki is an informant in the District and general creeper with a crazy laugh. Now, everyone part of this other world uses something called midas money to duel others and spend in the real world which is why it gets screwed over. Apparently, almost all of them are money grubbers who only fight for their own benefit. Of course, bringing “fake” money into circulation in mass quantities throws off the balance of the economy. I won’t delve too deep into the logistics because they don’t matter and I don’t fully understand the system myself. Each person has an Asset which is like… an astral being?... I don’t know, anyway, they represent their respective owner’s future and they fight in battles (duels) against other Assets like their goddamn Pokémon or something. And the whole micro-, mezo-, macro- flation based attacks are just silly. There’s a bunch of other stuff that happens in between the fighting but it’s irrelevant to the overall scheme of things. For example, you don’t find out what C is until the end. The hell? The show doesn’t do an adequate job of explaining anything in enough detail to really understand what’s going on at any given time. As the story progresses, it gets more convoluted once you see cities digitizing into nothing along with the people inhabiting them. Countries disappear by ways of economic collapse. Organizations inside and outside the Districts have a hand in abusing midas currency, trying to prevent the future loss of nations, or attempting to preserve the present condition of those same nations. The antagonist, Souichirou, is an advocate for the present. He’s a suave businessman who holds a lot of influence in Japan as he’s at the top of the chain in the Far East District. He blames his father for the death of his sister because he prioritized his company over family. Ironically, Souichirou’s ideals become more like his dad’s after the event in that he starts believing money is power. To me though, he’s just a kid with a lot of toys but wants to play with everyone else’s. A stubborn man who pushes his values onto others because that’s the only way he knows to gain control over everything and mold Japan to his liking because he doesn’t believe in a future anymore. In the art and sound department, [C] tries to blend 3D and 2D animation together, like in the case of duels. However, sometimes they don’t blend too well and it just starts to feel disjointed. The character and Asset designs are pretty ordinary. Although, some of the Assets are definitely more out there than others in both looks and abilities. Now as far as songs go, I enjoyed them both. The rock opening paired with the fluid animation of currency falling from the sky and flythrough into the streets of the Financial District got me pumped up for what was to come but obviously the anime itself fell short of what the songs did to hype it up for. And the endings electronic beats, percussion, and great vocals served as a great way to close each episode as the show was in a way an RPG considering how Yoga and Msyu fought tougher opponents each time to eventually end up going against Mikuni, the BOSS if you will. I think partly why I fancied the ending score was because it reminded me of East of Eden’s ending for some strange reason. The voice acting was sufficient when it was in Japanese and god awful when they started speaking English. Seriously, everything was terrible when it came to the English talk. I’ll leave it at that and you can see for yourself if you still feel the urge to hear it firsthand. Fair warning, you could be audibly raped. My final grumbles about [C] is that I couldn’t relate to anyone or anything in the show and that made it so every emotional event that was supposed to evoke something out of me just failed miserably. Msyu losing limbs and crying out in agony didn’t even make me blink because I knew that she’d regenerate right once the duel was over. Kimimaro’s attempts to be heroic were not only boring but obvious and as a result I started liking him even less as a character. His existence value started at zero and doubling a zero is still only zero. My indifference towards it all was mostly due to the weak character development as you can tell. Msyu was probably the only one whose character evolved (not a Pokémon joke) within the story and that’s only because she didn’t know anything about being human until Kimimaro came around and ate ramen noodles in front of her. I know, right? Eating?! That’s insane! Ultimately, what this anime boils down to is its lack of any real flow to the plot and missed attempt at drawing emotion out of the viewers whilst giving us a crash course in finances which to say it didn’t do a good job of that either. Maybe, and I’m being generous here, if they didn’t do such a horrendous job of mimicking English speakers, I’d give it one score higher. Maybe. But if time was currency, I’d definitely spend it on something else worth my attention. 'C: The Money of Soul and Possibility Control' is an apparent response to the current state of business, and the recent global financial crisis. The main theme of this series is "present vs future", with the main antagonist on the "present" side of the argument vying for the control of the financial district against the protagonist's "future" argument. This could be a direct criticism to the banking industry for their irresponsible lending for short-term profits (the present), which ultimately led to the subprime mortgage breakdown and Lehman Brothers declaring bankruptcy, subsequently causing economic disaster in Japan as well (loss of future). Using a person's future as collateral for cash today is also an extreme representation of excessive lending. The story begins in the generic shounen fashion, with the "ordinary but chosen" student suddenly getting an invitation to participate in something greater, and given "powers" in the form of money and Digimon "assets". The underlying concept of this series is extremely weak, since it's based on an overly complicated battle system akin to 'Yu-Gi-Oh!' or 'Duel Masters', which relies on new rules and abilities introduced out of nowhere in the most deus ex machina manner imaginable to advance battles. We are literally being told that the protagonist is "blessed with a strong asset" because that's the only way to explain how he won the first battle, and one minute we're being told the amount of money in possession or strategy decides the outcome, the next minute they somehow manage to defeat the richer Sennoza without strategy (pure guts?). This series is also plagued from the presence of too many characters. There is simply not enough time in an 11-episode series to develop 20+ characters, and many of their actions did not make sense. 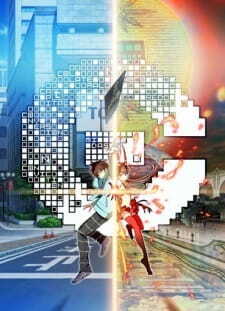 It was especially hard to identify the protagonist's motivation for rejecting the "present" view point, and his relationship with Hanabi, if she can even be called a heroine, since she is a non-presence in terms of screen time, and appears to be nothing more than a simple friend the protagonist has a little crush on. Every single opponent the protagonist faced are presented as good-but-misguided people fighting for an honorable purpose, and extremely forgiving towards the protagonist for destroying their lives. This is lazy scriptwriting, there's no excuse for it. The art and animation in this series is wonderful. The surreal alternative world, the dynamic presentation, the "wall" between the real life and virtual (Msyu sitting beside protagonist, the obtrusive word bubble etc), the action sequence... all makes this series very fun to watch. Character designs are pretty attractive, and other than slightly sloppy CGI in the second half of the show, it was perfect. Sound was almost equally wonderful, with excellent voice acting that fits well for every main character, especially that of Msyu by Tomatsu Haruka. Exciting battle BGM, and even more impressive was the music in slow scenes with the nostalgic and poignant feeling that they invoke. The OP was a good yet ordinary rock song, but the ED 'RPG' by School Food Punishment was an overwhelmingly fitting song for this series, accompanied by arguably the most visually pleasing ED animation since 'Tatami Galaxy'. I loved the atmosphere in this series. The narration and back-story for characters were also very enjoyable. However, they are too fragmented to make a huge impact to the main story. The single biggest flaw of this series is that the battles are far too superficial. Other money or life-game series such as 'Death Note' and 'Liar Game' had clear introduction of rules, which are enforced throughout the "game", using strategy or suspense for entertainment. On the other hand, 'C' used action, which simply does not make sense for a series of this kind. Strategies were superficial, and the consequences of loss (bankruptcy) were extremely vague. It feels like we're being shown a game's replay, rather than playing along with the protagonist. The premise of this series was amazing, with the existence of an alternative market, the Midas money, and the virtual world affecting the real. Unfortunately, the battle system was unable to fully capitalize on the concept. Perhaps the protagonist should've just turned into a stock trader or swindler... anyone using wits to earn money instead of a virtual pet who had nothing to do with money. It also wasn't clear how the virtual world functioned, and what purposes they served. SEA financial district bankruptcy that destroyed Singapore sending "shock waves" approaching other markets? It was literally depicted like tsunami approaching on screen with a countdown rather actually showing how global businesses are connected and affected by international markets. It got so bad that there was a big stylized letter "C" moving across the ocean on a screen to represent the economic effect moving. In the end, nothing was explained, and the protagonist's efforts were in vain. The world turns as usual, and the corrupt financial districts will continue to exist. The message of the series was also very conflicted. It started out as blatant criticism of the banking industry and questioning the importance of money, then it was the trust in the currency, and finally the big bad America? I did like how they attempted to show the futility of printing money to fix economic disaster (representing the futile Quantitative Easing), but it makes no sense to use losing face value of a currency as a crisis when Japan's recession today is mostly attributed to the strong yen. It also didn't really make sense to blame the U.S. for the financial crisis, because well, if it wasn't trade relationship with America, they would not have had the money to lose in financial crisis in the first place. Not to mention it was the U.S. that suffered the most in this recession. Like it's mentioned in one episode, you prosper together in a network, fall together too. Random business jargons were being thrown out throughout the series, with terms like "entrepreneur" (they would usually just say "Kigyouka" in Japanese for that), "collateral" ("future" as "collateral" should not be affected until failure of repayment, so why does printing more money using future as collateral instantly destroyed people's future? ), and nonsense battle moves like "Macro/Mezzo/Micro-flation", "M&A", "Overheated Economy", and "Cannibalization" (this term in business means launching a new product that eats away the sales of existing product of your own company, not eating others) etc. just makes it obvious those terms were being used simply to sound cool and an attempt to appear different from every other shounen battle anime. 'C' is a total failure in addressing real world issues. The setting, story, and character development are disastrous, but visual and audio presentation are very pleasing with good pacing. It's an enjoyable series as long as you don't think too much or take it too seriously. It is, after all, a show that has chosen style over substance. Anime is a form of entertainment usually marketed towards an otaku fanbase, making it difficult for people unfamiliar with that culture to step in. The noitaminA programming block was created to serve as a gateway to that audience. But how well have they kept their promise throughout the years?